George Dickerson was born in July of 1933 in Topeka, Kansas. His television career began in 1979 the television series "A Man Called Sloan". 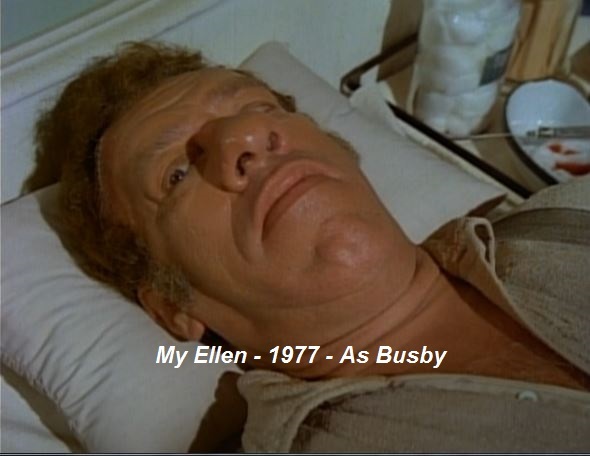 He made subsequent appearances in House Calls, Charlies Angels, Hill Street Blues, B.J. and the Bear and The Greatest American Hero to name a few. 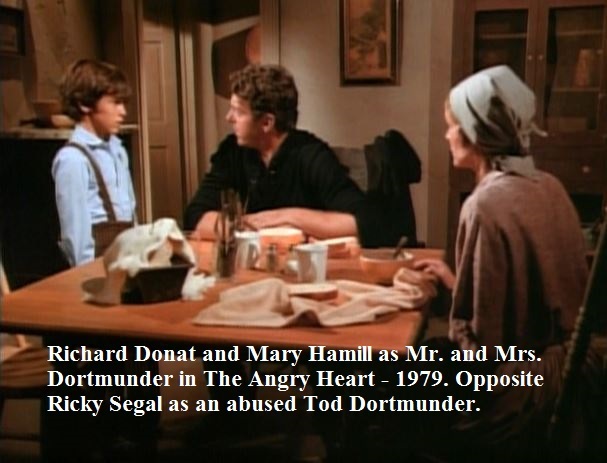 In 1982 he was in Father Murphy in the episode "In God's Arms" as Mr. Wade. Twenty years after breaking into television, he made his last appearance in "A Stranger In The Kingdom" as Sheriff Mason Wade. Barbara Beckley began her acting career in 1980. She had twenty three credits before she left the screen in 1997. They included Lou Grant, Dynasty, Matlock, and Dallas to name a few. 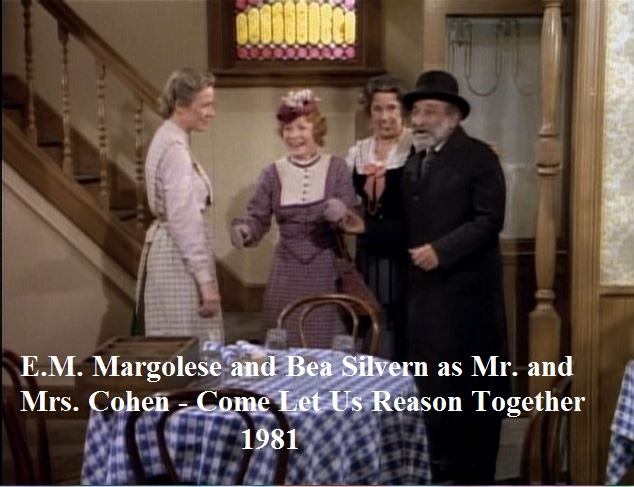 She was in one Highway To Heaven episode entitled "Friends" in 1986 as Mrs. Bates. Her last appearance was in Port Charles in 1997. 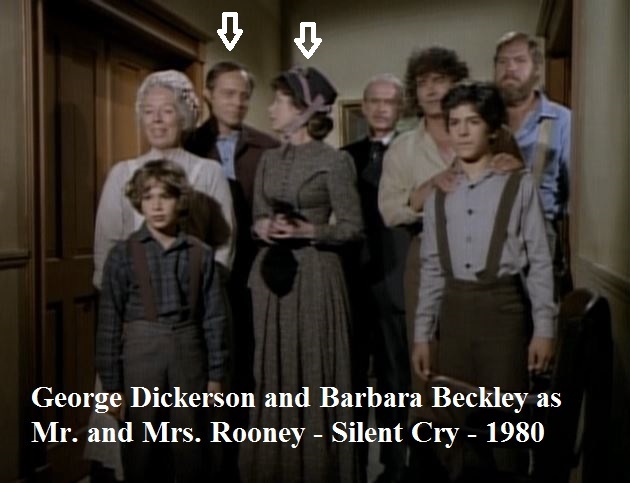 They both appeared in one episode of Little House. They adopted Michael and Josh. E.M. Margolese was born in July of 1920. His first appearance on television was on a TV series called “Encounter”, way back in 1950. Way back in 1955. He had 17 credits as an actor throughout the next forty four years. His last television appearance was in 1999 in a series called “Due South”. He passed away at the age of 80 in Canada on June 16th, 2001. Bea Silvern was born in March of 1926. She had 29 screen appearances, mostly television in career that lasted for forty two years. They included The Untouchables, Police Woman, Charlie’s Angels, CPO Sharkey, Eight is Enough and The Jeffersons to name a few. She was in one episode of Highway to Heaven as Miss Wilson in Jonathon Smith Goes To Washington. She also appeared in Dallas as Sarah Ewing in 1987 and 1989. She passed away in August of 2013 at the age of 87 in Los Angeles. Woody Eney was born in June of 1937 in Canberra, Australia. His first television appearance was in 1976 in Ryan’s Hope. He had 57 credits to his name through 1993 with his last role in Homeward Bound: The Incredible Journey. Other appearances during his seventeen career included Roots, Happy Days, Laverne and Shirley, Eight is Enough, The Waltons, Dallas, Falcon Crest and Family Ties. Aileen Fitzpatrick had her first television role in 1975 in a TV movie entitled F. Scott Fitzgerald in Hollywood. She followed that up with roles in Eight is Enough, Lou Grant, Knots Landing, Cagney and Lacey and Cheers. 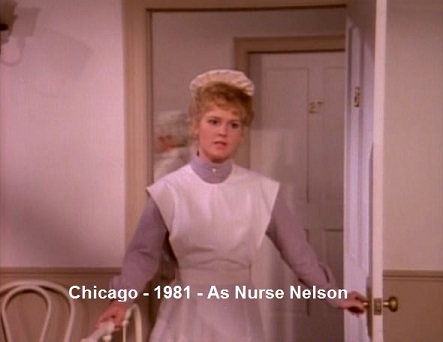 Her last role was in 1995 in the TV series VR.5 as a nurse. Richard Donat was born in June of 1941 in Kentville, Nova Scotia, Canada. He is known for his roles in Canadian and American television. He is currently into his fourth season as a cast member of the Canadian-American TV series, Haven. Donat is the younger brother of Peter Donat and the nephew of British actor Robert Donat. Walton’s fame from 1956 through 1972. The marriage ended in divorce. Donat has had a long career playing character roles mainly on television, though he has had minor roles in films such as The Weight of Water and Amelia. He has also narrated several documentaries, including a number of Nova episodes. Among his TV appearances Donat was Doctor Burnley in the Canadian television series Emily of New Moon from 1998 to 2000. He played Colonel Boyle, the fort commander in the Canadian comedy series Blackfly for its two seasons, 2001-2002. Currently he plays Vince Teagues, one of the editors of the local newspaper in the town of Haven from the TV series of the same name. 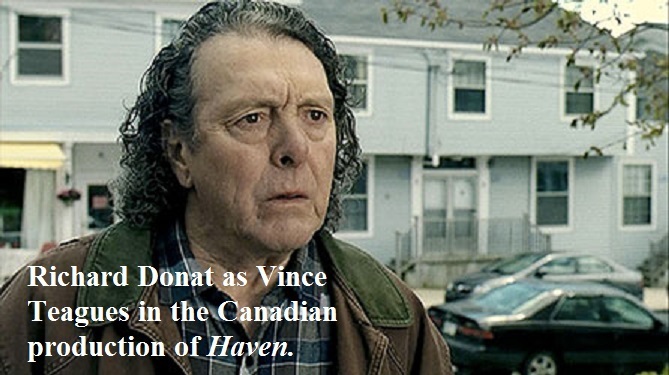 Although Haven is supposed to be in Maine, the series is filmed in Nova Scotia where Donat hails from. In 1984 Donat won a Dora Mavor Moore Award for "Outstanding Performance by a Male in a Leading Role" for his work in Brecht's In the Jungle of Cities. In 2007 he won a Merritt Award for "Outstanding Performance - Supporting Actor" for his role in Sam Shepard's Fool For Love. Richard Donat is also a director and won the Mecca Award in 2004 for his direction of The Drawer Boy. As of 2014, his last project was "Lure” which is now in post- production. Mary Hamill was born in December of 1939 in Flushing, New York. She was an actress in nine productions from 1977 through 1989. They included Logan’s Run and Quincy M.E.. She was also the dialogue coach in the TV series Annie McGuire from 1988 through 1999. During the last two years she was in Knick-Knacks and Winter Rye, two short subject films. Hugh Warden was born in January of 1914 in Oklahoma. He began a brief acting career that consisted of 19 credits in 1966 in the TV series Perry Mason. Seven years later he came back to the screen the movie “Tom” and followed that up with appearances in ABC Afternoon Specials, Death Wish II, and the TV series Seven Brides for Seven Brothers. His last appearance was in 1986 in Beyond The Next Mountain. He died in Los Angeles in February of 1986 at the age of 72. Delores Albin, also had a brief acting career. Her first role was in the TV series Thicker Than Water in 1973. Other appearances included Flo, WKRP in Cincinnati, Father Murphy , Happy Days and Night Court. Her last role was in Sisters in 1994. She was in one Little House Episode. Hugh Warden appeared in two Little House Episodes. He was a ticket Agent in The Empire Builders in 1982. 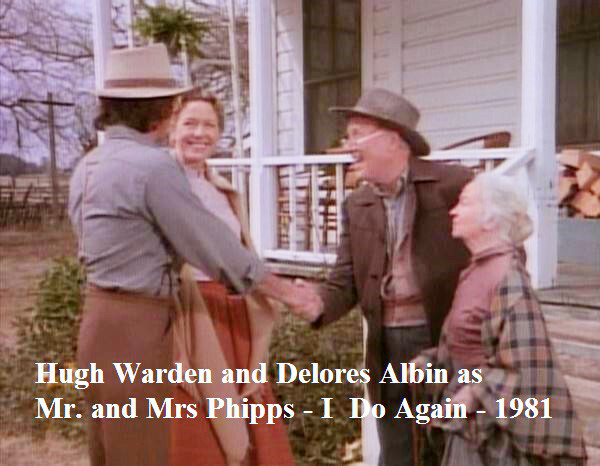 One year earlier he was in I Do Again as Mr. Phipps. Lorrie Blower worked for Michael Landon in three productions and disappeared from the acting scene. 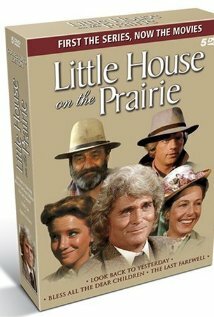 In the spring of 1983, Michael and the crew were working on writing three "Little House" TV-movies that would wrap the series--and in an unusual way for the series to end. Three scripts were written and approved by NBC. They were "Look Back to Yesterday", "Bless All the Dear Children", and "The Last Farewell". The final film, "The Last Farewell" was written and directed by Michael Landon. 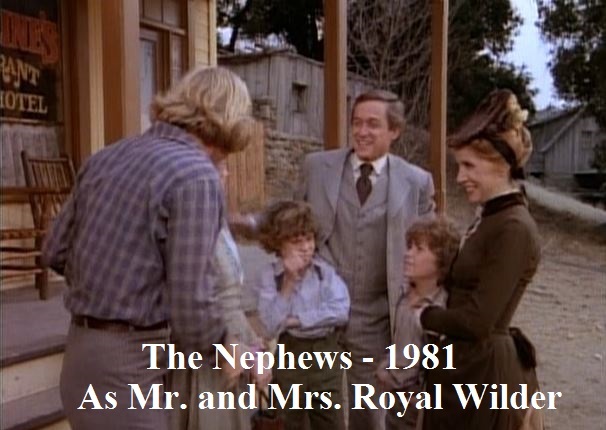 They were all filmed back-to-back in June and July of 1983. Post-production was from August through October 1983, with the network slotting them for airplay some months ahead. "Look Back to Yesterday" was aired on December 12, 1983, with Albert Ingalls contracting a rare and deadly blood disease. However, Albert survives the ordeal as Michael didn't believe in killing off good characters on his show. The silence of film explains it perfectly. Not to mention he and Matthew Laborteaux were very close, like father and son. "Bless All the Dear Children" was the second television movie made and later aired on December 17, 1984. Laura and Almonzo's infant, Rose Wilder, is abducted by a woman, but all turns out well at the end of the story. "The Last Farewell" was the third and final television movie made and later aired on February 6, 1984. In the climax, the townspeople blow up all the buildings in Walnut Grove, to keep greedy land developers from building on their land. Only the church and the Ingalls' homestead remained intact on the property. The final scene has white rabbits outside the house, that the Carter's children were raising in the story. His Brother Was On Gilligan's Island! Ken Johnson, birthdate unknown, is an actor who was in 27 titles from 1966 through 2004. He was an imposing figure that often played bully types because of his size. He appeared in such movies as 1000 Corpses, Massacre at Shelton High, So I Married An Axe Murderer and The Killing Stone. 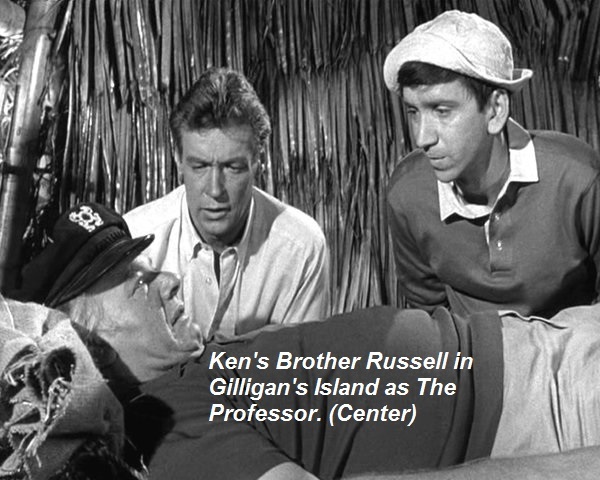 His Brother was Russell Johnson of “Gilligan’s Island fame. He and his brother do look alike! Why would someone born in Cleveland in 1929, who had acted in New York off-Broadway plays, want to write western screenplays? Don Balluck said that it came about as a complete surprise. He’d never been interested in westerns until he moved to Los Angeles. His wife and infant daughter took a plane while he packed up the car and drove from New York. Deciding to take the northern route through Utah, “with the sun frying me and the dust blowing, I stopped the car and got out. What I experienced I couldn’t get from a hundred books or movies about the West. There were mountains in all directions. I couldn’t believe how many. It looked like every person in the state could own one and there’d still be thousands left over. But the experience didn't convince him to write western scripts until sometime later. When he was assigned his first western script, he was able to relate to his Utah experience “instead of some old Gary Cooper movie. Later on, I was able to spend considerable time in places like Texas, Arizona, Montana, and the gold country in central California around Modesto, and my appreciation deepened. 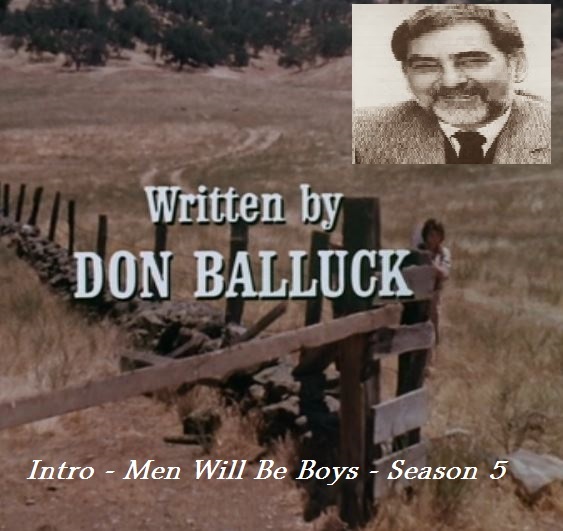 He also served as executive story consultant on both “Little House” and “Father Murphy”. Covering forty-five episodes in one season was a bit much, “so the following year my assistant took over 'Father Murphy' and I stayed with 'Little House'"
Asked if situations or characters were more important in a TV script, he said, ‘The situation is critical in order to sell the idea. It mustn’t be overcomplicated and it has to contain elements which suggest story possibilities, if we’re talking about a series. Once that’s established, full attention to the characters must be made or it won’t go far. ‘Magnum,' for example, was an outstandingly good situation where the lead character has it both ways. One: he’s broke and needs to hustle clients. Two:: he’s able to live a lush lifestyle courtesy of his rich friend. Yet how long would it have lasted without such good chemistry of lead characters? When asked what kind of metamorphosis a script goes through before it’s finished, Balluck said, “Make sure the mechanics of the story work or it could backfire. With the confidence that it does, all manner of exciting discoveries are possible in the creative phase of the actual writing, If we’re talking about a screenplay and not a television episode, I wouldn’t ever be concerned about it being too long. The editing process, if one is good at it, can be extremely enjoyable and will take care of the necessary cutting. 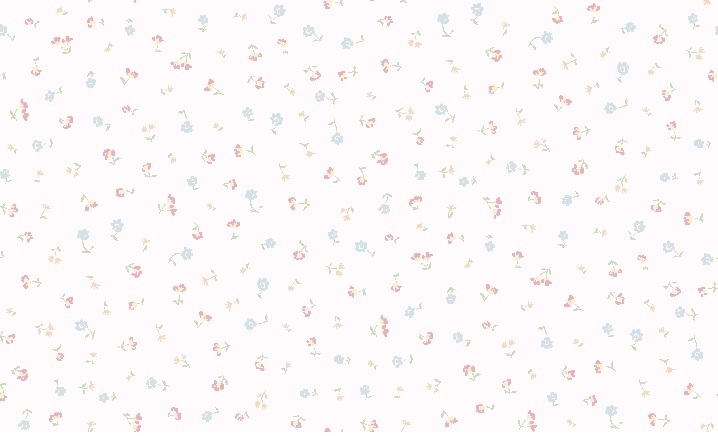 Then once it’s as good as it can be and a proper length, start combing through it and make it better. I generally don’t consult anybody until I’ve repeated that process enough and have no further ideas for improvement. If it’s an assignment, the producer will know who has a comparable expertise. Amateur opinions can be deadly. Most valuable screenwriter personality traits, he said, are courtesy and a sense of humor. "We have to deal with a lot and it’s just plain prudent to maintain a certain equanimity. There’s strength in getting what you want without hurting or humiliating anyone." Don passed away in April of 2000 in Burbank, California. He was seventy years old. One great writer! Ever Wondered Who Bunny Really Was? His name was Ott and was owned and trained by Bobby Davenport. Ott was a thoroughbred stud. He was one of Hollywood's top horses from the 1960's through the 1980's. Owner-trainer Bobby J. Davenport got him in the early 1960's near Lone Pine, California. 5’5” tall. His name was Ott and was owned and trained by Bobby Davenport. He was a thoroughbred stud and a Tony Award Winner! What Mr. Davenport did in his private life is no business of ours. Owner-trainer Bobby J. Davenport got him in the early 1960's near Lone Pine, California. 5’5” tall. How does a horse win a Tony? I did wonder this, myself. "Equus," maybe? Still, not to disparage Ott's talents, but how does one horse distinguish himself from another in the legitimate theater? I don't believe I've ever typed that sentence before. Oh! Well really it isn't all *that* obvious of an error. You just never know with show business. "Tony Award winner" can hardly be construed as a typo, young man. Listen you slimey nave! When one does over 570 bios, there are bound to be some errors! We aren't talking prayers, recipes and funny little pictures here! It's a lot of work! ...slimey... prayers, recipes and funny little pictures...! Did you see that, everybody! Dave bad-mouthed praying, eating and laughing! Wow! I just watched "To Live With Fear" and there is a scene that had been cut with a lady in it helping Caroline do the laundry. In the credits she is listed as Cordy Clarke. Did you profile her yet Dave?